Theodore Shrady - Website of risingtidewriters! My area of concentration is the history of the passenger train: the cars, particularly sleeping cars; the trains and railroads on which they ran; and the people who worked on them. My fifth railroad book, For Pullman Eyes Only, focuses on the inner workings of the Pullman Company, an enormous enterprise that manufactured, operated, maintained, and staffed most of the sleeping cars in the country after 1900. 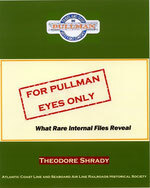 While living in Chicago, I had access to the Pullman files at a private library, The Newberry. Exploring those files revealed a treasure trove of information most never before published and rarely seen by the public--a behind-the-scenes look. The chapters include operations, special cars, experimental trains, accidents and injuries, disruptions of service, and Mexican operations. The book has a glossary, appendix with addtional material, and a detailed index. It is soft cover of 112 pages and over 140 photographs and illustrations. My early publications include three editions of the Orange Blossom Special with co-author Arthur M. Waldrop and The Sleeping Car—A General Guide. All of the books are published and sold through the Atlantic Coast Line & Seaboard Air Line Railroads Historical Society in Jacksonville, Florida, www.aclsal.org. Because of my lifelong interest in railroads, I joined the New York Central System (NYCS) in middle management from 1964 to 1968. I traveled more than 175,000 miles by train on the NYCS and other railroads. This experience provided much fodder for my books, and for more than four dozen articles published in railroad magazines and newsletters. After the NYCS merged with the Pennsylvania Railroad in 1968 forming Penn Central, I went into the audio visual/media business for 30 years, spending the last 10 years at Harvard University, where I started writing. As an employee, I had full access to their library stacks, another gold mine of railroad information. I retired in 1999 and resumed railroad research. Now living on Cape Cod, I research and lecture on various railroad subjects. My personal library contains more than 250 railroad books and over 6800 photos to aid in reseach at home. Please contact me about any questions regarding railroads, or if you would like to schedule me as a speaker, shradyt(at)verizon.net .